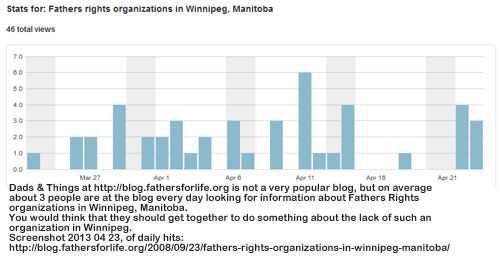 There are no fathers rights organizations in Winnipeg, Manitoba, Canada. It is not possible to figure out why. For years now, we were contacted virtually every day [on average two times a day during March 2018] with requests for information on and pointers to fathers rights organizations in Winnipeg or anywhere in the province of Manitoba. Here is an example of such an information request. We are wondering if there is anyone in Winnipeg Manitoba to contact for some information or assistance in dealing with a nasty custody battle. The legal fees are huge and we are getting know where. All custody battles are nasty, except for those people who like to engage themselves in them because those battles provide some gains or an income. Legal fees are not truly ever huge, but lawyers fees most often are. That is because lawyers have and maintain a monopoly on the services they provide. Even though judges are lawyers, too, they seem to cost not so much to normal mortals, except when one begins to consider how much social engineering is being done by the judiciary, what the costs of that are and that all of those costs are being paid for through tax revenues that are being sucked out of our pockets. For about 30 years now I have been involved as an activist in issues such as those that threaten you now, but there never was any individual activist or fathers rights organization that anyone could be referred to in Manitoba. Previously, a directory of Canadian equal parenting organizations never showed any listings for fathers rights organizations in Winnipeg, Manitoba. Still, Manitoba divorces, divorce courts and custody battles are just as devastating and destructive as are those in other provinces. However, as the identified directory shows, there is now one such organization in Manitoba, although I am not sure how or whether they can or will be of help to you. If all else fails, consider that there is nothing preventing you from starting an effective and practical organization in Manitoba. Given the considerable number of inquiries about such (non-existent) organizations in Manitoba we received in Alberta over the years, the demand for services, advice and comradery offered by such an organization certainly appears to exist. It needs to be nothing more than the opportunity for parents in comparable circumstances to meet on a regular basis. It seems that a newspaper ad, run [in the classifieds] for about a week, would result in a good list of interested individuals. Are you a dad? Feel like you have no rights as a father? Have not seen your children or worse, don’t know where they are? Support us, we are fighting for rights for fathers to be more involved with their children upon a divorces or separations from their spouses. Share, post and comment at our DADS page on Facebook! Be careful about selecting a lawyer. We have often been asked for advice on that, so often that we posted some generic advice on how to select a lawyer, contained in the following articles. This entry was posted in Child-Custody Awards, Divorce, Family, Men's Issues, Organizational News, Paternal Rights, Shared Parenting. Bookmark the permalink. Looking for fathers/families to join the fight! Dads are getting the short end of the stick and we need to rally!